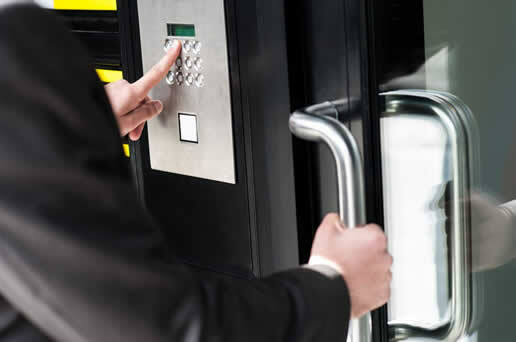 We have a choice of access control solutions to best suit your needs. This is suitable for domestic properties who want to make sure they know who is at the door before they open it or commercial who want the ease of not having to get up every time someone comes to the door. Ideally the camera should have night vision so that there are no problems seeing the caller at night. A proximity or RFI reader is placed on the relevant door, along with a magnetic lock; each person who requires access is provided with their own tag card or in some cases App. This means you can control who has access to certain buildings or rooms easily, but cannot necessarily track information from this. If you require a larger system, with more functionality and variability, this can be controlled centrally with a system such as Paxton Net2. Paxton provide the standard software required for the management of the system Free of charge. This allows the user to completely control the system, adding up to 10,000 users and changing each ones access rights as necessary. And with the introduction or Net 2 Pro software and Net 10 the door access can be integrated with building controls from the fire alarm to the lifts to turning a light on when a certain person enters the building. Our access controls can help you monitor and protect your home or business, not just giving you full control over who gains access, but a whole host of feature. Unfortunately, with unemployment at an all-time high and money hard to come by it is becoming increasingly important to protect your property and belongings. Sonitech can offer a custom Access Control system to suit your individual needs, from a bungalow to a warehouse, our systems are fitted with the latest equipment from leading manufacturers recognised by insures to give you peace of mind.